A new dimension is being added to the Suzuki Vitara with the arrival in New Zealand of a more powerful, highly efficient direct injection turbocharged sports version. The superbly specified Vitara Turbo is powered by a new light and compact 1,373cm3 K14C engine which is the first application of Suzuki’s advanced Booster-jet technology. It produces 20 per cent more power and, more significantly, a remarkable 41 per cent increase in torque than the normally aspirated 1.6 litre JLX Vitara models which continue in the range. Maximum power of 103 kW compares with 86 kW for the 1.6-litre motor, and the 220 Nm of torque is available from just 1,500 rpm to 4,000 rpm. In spite of increased power and torque, fuel consumption is virtually the same as the larger engined model. Excellent fuel efficiency and strong performance have been made possible by using a small displacement, high torque turbocharger. By controlling the wastage valve, which closes to create higher boost pressure during heavy load operation and remains open during normal driving, the system reduces pumping loss, resulting in high levels of both power and fuel-efficiency. In light driving the wastegate is opened to help engine breathing and boost efficiency. The engine revs keenly from 1,500 rpm and is also noted for its quietness and high level of refinement. Suzuki engineers have almost entirely eliminated the typical delay in turbo power delivery or lag by installing the specially developed compact turbocharger directly to the cylinder head as well as incorporating the exhaust manifold into the cylinder head casting. This design ensures optimum gas flow with minimal heat loss through to the turbocharger which has a boost pressure of 1.1 Bar. “Historically, power and torque delivery from a turbocharged engine would not have been available until much high engine speeds, offering less flexibility,” said Suzuki. The chain-driven double overhead camshaft, the 16-valve engine offers strong performance benefits with a 0 to 100 km/h acceleration time of 9.5 seconds and a maximum speed of just on 200 km/h. In the official Australian combined fuel cycle the Vitara Turbo with automatic transmission returned 5.9 litres/100 km (47.9 miles per gallon) compared to 6.0 litres/100 km (47.1 mpg) for the 1.6 Vitara automatic. Rodney Brown, Service Manager for Suzuki New Zealand, pointed out that the turbo engine produces linear power delivery across the rev range. “Essentially the benefit of a turbocharger is that it increases the volumetric efficiency of a given engine displacement, therefore performing like a large engine but with much better fuel consumption,” he said. “Direct injection injects fuel directly into the cylinders, unlike a port fuel injection system that mixes fuel and air in the intake ports and feeds this mixture into the combustion chamber. Direct injection optimises the control of fuel injected to achieve efficient combustion and better economy,” said Brown. Mid-range performance is especially good, with maximum torque available from as low as 1,500 revs to 4,000 rpm. The new model has a 47-litre capacity fuel tank and Suzuki specifies the use of 95 octane petrol or higher. The six-speed automatic transmission with torque converter has a wide gear ratio range to give precise driver control and help provide quick response at low vehicle speeds when pulling away from standstill or driving slowly uphill. The automatic has an expanded lock-up range to promote good acceleration, excellent fuel economy and low levels of noise, vibration, and harshness. Additionally, the driver can override the automatic transmission by selecting the manual mode to specify ratios using shift paddles behind the steering wheel. Like other Vitara models, the new Turbo is available with either two- or four-wheel-drive systems. While four-wheel-drive is usually detrimental to fuel economy and emissions performance, Suzuki’s Allgrip system enables CO2 emissions to be remarkably low for a 4WD SUV. The front wheel driven Turbo automatic emits 138 grams/km and the automatic All Wheel Drive produces 145 grams/km. 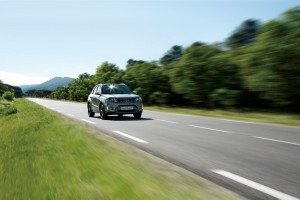 The Vitara’s CO2 emissions are low thanks to the use of high-tensile steel and other weight saving measures in the body. This has resulted in the Vitara being one of the lightest SUVs in its class at just 1,160 kg for the 2WD model and 1,235 kg for the AWD. The 2WD Vitara Turbo is just 30 kgs heavier than a Honda Jazz. The Allgrip 4WD system has four driver-selectable modes – Auto, Sport, Snow, and Lock – for all types of driving on diverse surfaces. Allgrip made its debut in the Suzuki S-Cross which launched in 2013. During development, the Allgrip system was enhanced by the addition of a feed forward function that locates torque to the rear wheels before any slippage occurs. On conventional full-time 4WD vehicles, feedback control allocates torque to the rear wheels after detecting front-wheel-drive slippage. However, the new Vitara, as well as offering feedback control, also anticipates slippage based on road surface, throttle opening position, steering angle and other factors. Rather than reacting after grip is lost, it controls the vehicle to prevent grip from being lost, thus providing greater stability. MacPherson strut front suspension is matched to a torsion beam arrangement at the rear and, in keeping with the upgraded performance capabilities of the turbo engine, the Vitara Turbo has slightly stiffer coil springs and dampers. Safety features include seven airbags (front airbags for the driver and passenger, driver’s knee airbag, side airbags for the driver and front passenger, left and right curtain airbags), stability control, anti-lock brakes with electronic brake force distribution and emergency brake assist, reversing camera, front and rear parking sensors, auto-levelling and dusk-sensing LED headlights, LED daytime running lights and automatic wipers. The Vitara Turbo is easily distinguished by a unique chrome five-slotted grille design, 17-inch black alloy wheels with 215/55 R17 tyres, satin silver finish door mirrors and LED daytime running headlamps with red protector covers. Inside the sporting theme continues with red upholstery stitching, leather seats with suede inserts, red accents for the instruments, air conditioning and ventilation vents and aluminium alloy pedals. Rear side privacy windows, front fog lamps and silver roof rails are part of the standard package that also includes satellite navigation-equipped infotainment system with Apply CarPlay, Bosch media six-speaker media unit, cruise control with speed limiter, keyless entry and ignition, climate control air conditioning, Bluetooth and USB connectivity and steering wheel sound system controls. Also included are power windows and mirrors, power-folding door mirrors and the option of two-tone exterior paint schemes. Unique to the Vitara Turbo is Bright Red body colour with black roof. This is the only non-metallic paint and the other seven colours are Cool White Pearl, Cosmic Black, Savannah Ivory, Horizon Orange, Atlantic Turquoise and two tonnes of Premium Silver. The Vitara has a ground clearance of 185mm, 18.2-degree approach, and 28.2-degree departure angles which compare well with rivals. Suzuki New Zealand expects the price-leading two-wheel-drive Vitara Turbo automatic will be the most popular model in New Zealand. It will have a recommended retail price of $33,990, plus on-road costs, while the four-wheel-drive version is $37,990. The new Turbo is expected to account for 55 percent of all Vitara sales in New Zealand and will be on public sale from 1 July.